“It’ll be bigger than Ben Hur but without the chariots,” enthused Mudgee Race Club Secretary, Colleen Walker, in her charming accent. Fittingly on Max Crockett remembrance day, Friday’s historic Mudgee Cup TAB race meeting has attracted unprecedented exposure and interest, and a Cup field to match. Certainly Max, the master local horseman who passed away last week at 74, and will be honoured by jockeys wearing black armbands, wouldn’t have seen a local raceday anything quite like it, amidst his numerous hometown Cup wins. On the racetrack, or off it, in Mudgee in the ensuing days. It all starts on Thursday night with a Cup Calcutta and phantom race call hosted by the TAB’s and Racing HQ’s Glenn Munsie followed by the Sky’s Big Sport’s Breakfast’s Terry Kennedy and Jimmy Smith broadcasting from dawn in the town centre. Channel 9 and NRL presenter Erin Molan is another special guest. So too is Racing Mates ambassador, Pat Webster, whom will be hosting a Racing Mates Morning Tea Get-Together on the course at 10am this Saturday. The profile stables of Kris Lees, Joe Pride and Bjorn Baker have targeted the $50,000 Robert Oatley Vineyards sponsored Showcase Cup (1600m) and supporting races. The leading regional stables are out in force. Among them Cameron Crockett, the acutely educated racing son of Max, Rod Northam, Brett Thompson and Damien Lane. And of course, record achieving Country riding veteran Greg Ryan who is in brilliant touch for his hordes of supporters and has a full book. “We’re taking the Mudgee Cup day to another new and exciting level- it’ll capture a larger and perhaps a different audience,” Colleen added. It’ll be a fabulous couple of days for the locals and the crowds of visitors who will be here. The Cup field sees Northam’s regional Cup’s specialist Red Knot and Lee’s former Kiwi Our Gravano prominent in betting. Red Knot’s 61kg has been reduced by the 3.5kg claim for Reece Jones while Our Gravano has been primed by Lees off two recent barrier trials and he’s a city grade and five race winner in NZ. The value runner is another former Kiwi, Appoint Percy for astute young Canberra trainer Luke Pepper. Appoint Percy was rated up to city grade by Pepper after winning a city TAB Highway race three seasons ago, but then suffered successive long-term injuries. However, now a seven-year-old, Appoint Percy is a rejuvenated talent. He has led for courageous winning double at Canberra recently carrying 61.5kg and 59kg. He’s seriously well-weighted with 54kg less the 2.5kg claim for Courtney Gravener, as he’ll lead or box seat. And Luke set the gelding for this race some time ago after a comeback win. 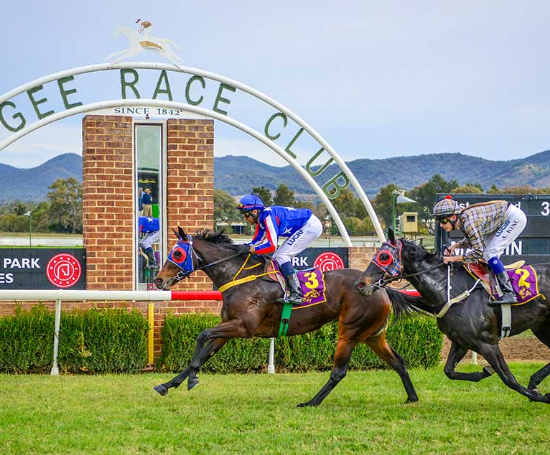 Mudgee will race on a good four surface in fine weather.